Branding & marketing components for plastic part manufacturers. Websites have become the main engine of brand communications. Likewise, the parts and pieces that make up a site drive the brand style and voice. When the time came for Miles Products to replace their old website, Graphite & Lead was hired to rethink the company's entire online approach. Miles Products are sales and marketing representatives for a range of custom molded plastics manufacturers. Our client and their partners mainly produce internal plastic parts and components that are used in larger finished products such as cars, medical equipment, electronics and many other consumer and business products. In a nutshell, they make widgets, very complex and sophisticated, but gizmos to us non-engineer types. The redesign of the Miles Products logo and typographic style shown above represents the intricate molded parts they make. Miles Products has used blue as its corporate color for many years. However, the three main companies they represent all have very different brand styles and colors. To pull the range together and bring a cohesive look to our umbrella brand, we pulled a color from each of the partner's logos to make the new Miles color scheme. An icon was designed in its corresponding color for each of the main processes that include injection molding, insert molding, structural foam molding and plastic molded prototypes. Theses can be seen above. Several screen grabs and notes on the website design are below. The website can be checked out here. The new color palette is quite bright compared to what is often seen in the industrial market. This helps us stand out and brings a fresh modern feel to the Miles website. The clean styling and vivid colors also make the drab plastic parts look good. Other graphic touches such as animated gifs add interest. We helped the client with their sister websites and content like this infographic. Our studio continues to produce and add new content and get extra marketing mileage whenever possible with promotions on LinkedIn and Google AdWords. 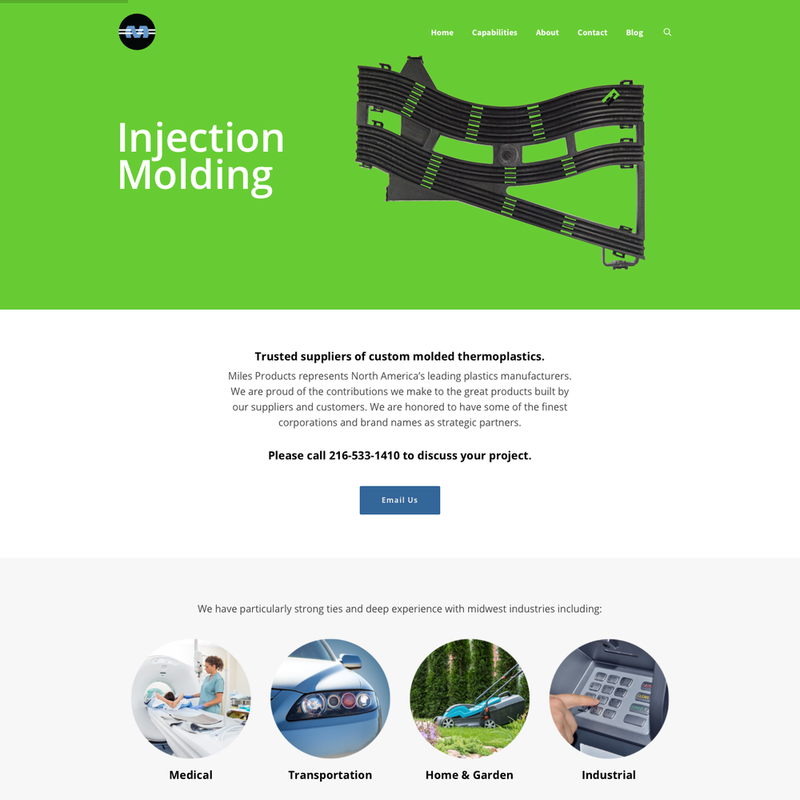 Animated gif illustration of plastic insert molding.